Published November 6, 2015 Filed under Immigration, Law & Justice, Policy & Regs, US News. Total of no comments in the discussion. This article was first published by our friends at The Center for Immigration Studies and is republished with permission. 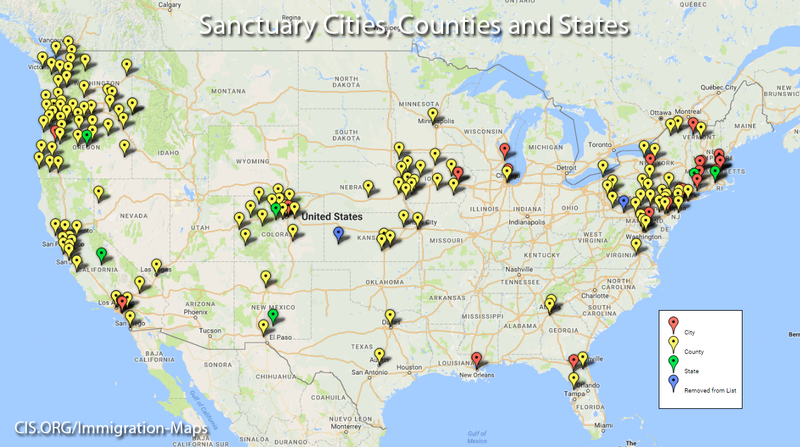 Across the U.S., there are 340 cities, counties, and states that are considered “sanctuary cities”. These jurisdiction protect criminal aliens from deportation by refusing to comply with ICE detainers or otherwise impede open communication and information exchanges between their employees or officers and federal immigration agents. Jessica M. Vaughan is director of policy studies at the Center for Immigration Studies. The number of jurisdictions that are obstructing immigration enforcement has grown to roughly 340, according to the Department of Homeland Security.1 This has resulted in the release by local authorities of approximately 1,000 criminal aliens per month. According to an updated report prepared by Immigration and Customs Enforcement (ICE) for Congress, between January 1 and September 30, 2014, local sanctuaries released 9,295 alien offenders that ICE was seeking to deport. More than 600 people were released at least twice. Out of these, 5,947 of the criminal aliens (62 percent) had significant prior criminal histories or other public safety concerns even before the arrest that led to a detainer. 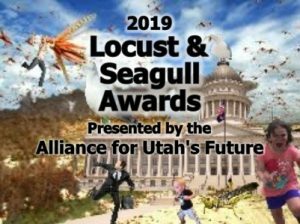 Fifty-eight percent of those with a prior history of concern had prior felony charges or convictions; 37 percent had serious prior misdemeanor charges, and 5 percent had multiple prior misdemeanors. An alarming number — 2,320 — of the total number of released offenders were subsequently arrested within the time period studied for new crimes after they were released by the sanctuaries. ICE was not able to re-apprehend most of the offenders released by the sanctuaries. As of last year, 6,460 (69 percent) were still at large. Of those still at large, 1,377 (20 percent) had another criminal arrest following the one that resulted in the ICE detainer. One violent illegal alien offender who is now at large because of a local sanctuary policy is Francisco Javier Chavez. In August 2015, Chavez was arrested for brutally beating the two-year-old daughter of his girlfriend, breaking a leg and both of her arms.4 Chavez has a long rap sheet, including felony drug and drunk driving convictions and a prior deportation. ICE issued a detainer, but the San Luis Obispo County Sheriff’s Department released him anyway after he posted bail, even though California’s law would have permitted them to hold him. Of the 6,460 criminal aliens who were still at large during the time period studied, 3,802 (58 percent) had prior felonies or violent misdemeanors. 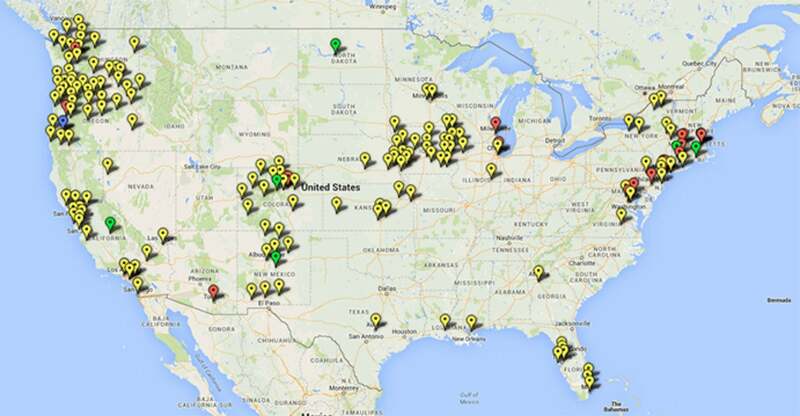 These jurisdictions have been added to our map of sanctuaries.6 No jurisdictions were removed from the list by ICE. A DHS spokesperson confirmed to me on October 5, 2015, that roughly 340 jurisdictions had adopted non-cooperation policies, but that some of those jurisdictions had recently revised their sanctuary policies to allow at least some cooperation with ICE. The spokesperson declined to provide either a list of the 340 total non-cooperative jurisdictions or a list of the ones that had allegedly improved their policies. 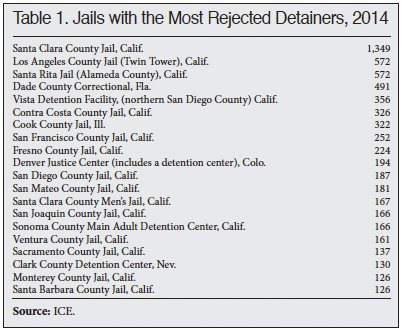 ICE has identified the 20 jurisdictions with the most rejected detainers. Most are in California. After we published the ICE report and its findings, including the map of sanctuaries, we received a few complaints from law enforcement agencies and a few requests to be removed from the list because they did not wish to be described as sanctuaries. Some sheriffs maintained that they would be willing to comply with ICE detainers, but are not able to do so because of local or state ordinances. To be clear, the list of sanctuaries was compiled by ICE, and I obtained it through a Freedom of Information Act request. Some sheriffs have stated that they should not be described as sanctuaries if they are participating in the administration’s new Priority Enforcement Program (PEP). However, PEP explicitly allows jurisdictions to obstruct immigration enforcement by ignoring detainers or barring ICE access to jails. Under PEP, immigration officers also issue “requests for notification” asking local authorities to tell them when a criminal alien in their custody will be released so ICE can attempt to take custody for deportation. Local agencies are free to ignore these notifications, or to choose which criminal aliens will be held for ICE. Some areas, such as Los Angeles County, have agreed to only partial participation in PEP.7 With such a policy, they are still protecting many deportable criminal alien offenders from removal. They are still restricting their officers’ ability to communicate with ICE, still obstructing ICE from performing its legitimate and important mission, and still putting people in their community at risk of harm from individuals who should instead be deported. Clearly, PEP is not even close to being an effective answer to the sanctuary problem. When ICE cannot take custody of criminal aliens in jails, it has to send officers out to the streets to re-apprehend them. This is expensive, dangerous, and upsetting to the community. I am told that one deportation officer can issue 10 to 15 detainers in a day, with a couple of others needed to take the criminal aliens into custody. But locating and arresting just one released criminal alien requires a lot more: one case officer to do the research and paperwork, at least two officers and a government vehicle to conduct five to eight hours or more of surveillance to home in on the subject, a trip back to the office to get the supervisor’s signature, another trip to the offender’s address to stake out and wait for him to leave his house, and potentially a public confrontation and chase that ensues upon contact. Multiply this by hundreds of targets, and it becomes a major commitment of resources to re-arrest just a fraction of the criminal aliens who are now on the loose. Sen. David Vitter (R-La.) has introduced a bill that would address the problem of sanctuaries in two ways.8 First, it would withhold certain federal funds to jurisdictions that restrict communication with or obstruct ICE from taking custody of deportable aliens. In addition, it would provide certain critical legal protections to the overwhelming majority of sheriffs and police chiefs who are and want to be fully compliant and cooperative with ICE. This bill offers an effective approach that will help reverse sanctuary policies and prevent the release of criminal alien offenders who are causing so much harm in American communities. Without disincentives, the diehard sanctuary jurisdictions will not change on their own. The Obama administration has said it will not act to discourage them, and actively enables them. Congress must not continue to allow these irresponsible sanctuaries to bog down ICE and to put us all at risk in the process. 1 Amy Taxin, “LA, others let immigration agents in the jails, rules vary”, Associated Press, September 28, 2015. 3 “AB-4 State government: federal immigration policy enforcement”, State of California, passed October 15, 2013; effective January 1, 2014. 4 Matt Fountain, “Mexican national accused of abusing toddler is freed despite request from immigration officials”, San Luis Obispo Tribune, August 4, 2015. 5 “Law Enforcement Systems & Analysis: Declined Detainer Outcome Report”, Department of Homeland Security, October 8, 2014. 6 Bryan Griffith and Marguerite Telford, “Map: Sanctuary Cities, Counties and States”, Center for Immigration Studies, July 2015. 7 Dan Cadman, “L.A. Sheriff Takes a Small Step Toward Reason with New Immigration Enforcement Cooperation Policy”, Center for Immigration Studies blog, October 5, 2015.